A painting & prints from the original of Loch Sligachan at sunset, Glen Sligachan on The Isle of Skye, Hebrides, Scotland. An original landscape painting & prints of Loch Sligachan and Glen Sligachan at sunset, on The Isle of Skye. Part of The Inner Hebrides on Scotland’s West Coast. An original abstract, atmospheric seascape / landscape painting of Loch Sligachan sunset, Glen Sligachan, Isle of Skye, Hebrides, Scotland. I love to combine & layer different types of paint & application of mediums including spray paint, oil paint, acrylic paint & others, creating a unique style of atmospheric painting of Loch Sligachan full of vibrant colour & drama. More about Loch Sligachan, Glen Sligachan & Skye here. Painting & prints of Loch Sligachan Sunset, Isle of Skye, Scottish Western Isles by Andy Peutherer. 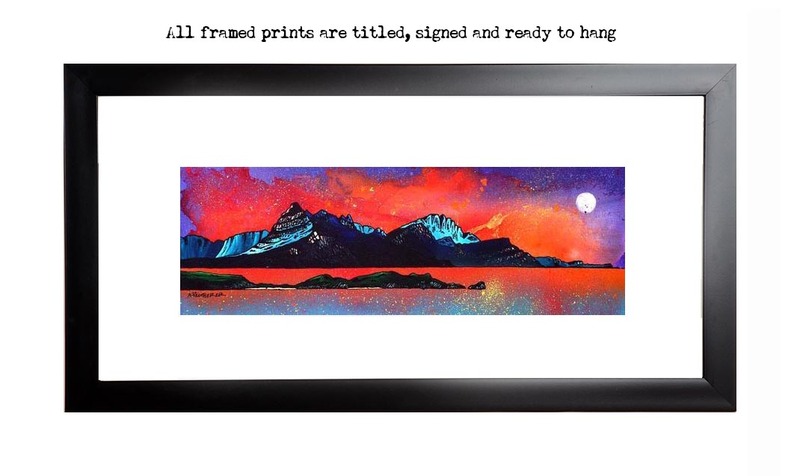 Framed prints of Loch Sligachan Sunset, Isle of Skye, Scottish Western Isles by Andy Peutherer.